"Is there a way back?" "People Running for their Lives 5"
2013, Gouache on Fabriano cardboard, 115x151cm. "Take Me Down To Phantom Ranch"
"The ice is still thin"
"In the Center of Uncertainty"
"Memory Gaps and Mental Flashes"
"Church in Lech am Arlberg"
Walter Mikes is a visual artist living and working in Vienna. Born in Vienna in 1951, he worked as a software developer at Siemens for more than 30 years. Since 1994 Walter Mikes has been painting regularly. 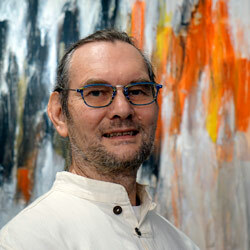 After a period of reorientation, he acquired a studio in 2012 and dedicated himself to painting. In his studio as well as during numerous workshops and journeys with artists like Bernhard Vogel, Jos Biersack, Wang Shu, Emil Waldmann, Lisa Kunit, Siegfried Karrer, Gerlinde Kosina, Alfred Hansl, Robert Zielasco or Sieglinde Wagner, Walter explored various subjects, materials and painting techniques in depth. "When I 'm painting, I'm often in a state of deep meditation and my brushstrokes don't follow a plan. My hand seems to move by itself. As if from a distance, I curiously observe what is happening while an intensive dialogue is going on between me and my artwork. After finishing my work it sometimes appears strange to me, as if I didn't paint it myself. Often it will only speak to me after a few days and makes me aware of a theme that was only subconsciously present until it found it's expression in my painting." The copyright for all images and graphics used on this website is owned by Walter Mikes.